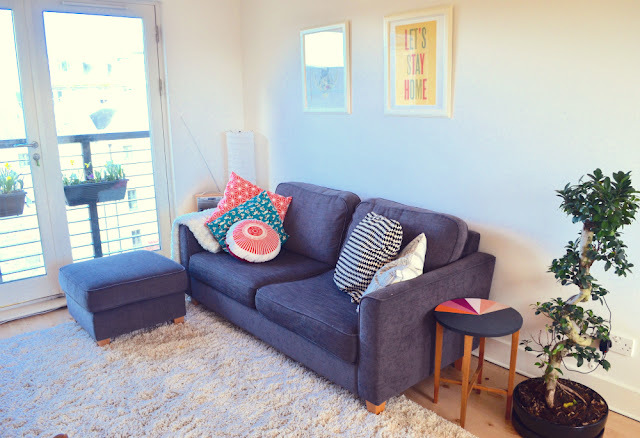 It's been a while since I last did a home tour post, so I thought today I'd show off my colourful, lovely living room! When I bought the flat, this room was all yellow, with light mustardy-yellow walls, dark yellow curtains, and black and yellow glass lampshades. 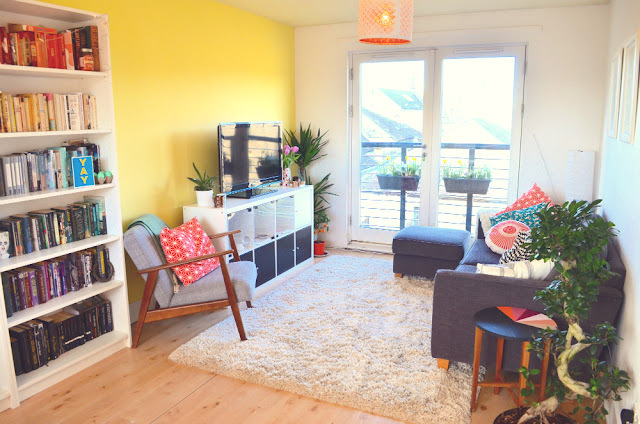 I loved how bright the room was, and I had been eyeing up very colourful living rooms, so I wasn't put off by the colour, but I knew it needed a bit of a boost. With a gang of helpers (thanks pals), we painted the whole thing, which took aaaages. 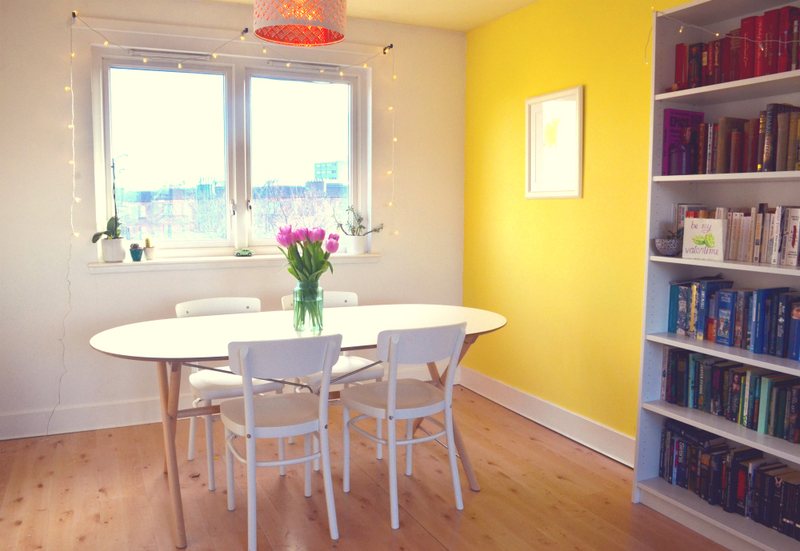 We painted three walls white (using Dulux White Mist) and repainted the main wall a much brighter yellow (Dulux Lemon Tropics), which instantly made the room feel much bigger and brighter. I took down the curtains at both ends of the room (I live on the top floor, so I figured there was no need really), and I replaced the lampshades with these cute white and copper cut-out shades. The room doubles up as a living and dining room, so I wanted to make sure it worked together as one big room with similar colours (white furniture, copper tones, lots of green leaves), but also could be used as two distinct spaces. I think the balance works out quite well - the sofa end feels cosy and nice to hang out in, and there's a bit more breathing space around the dining table so it doesn't feel too cluttered. It's so lovely having space for a dining table again, I forgot how nice it is to have friends round for dinner and not have to eat off your knee! My dining table and chairs are from Ikea (like most of the furniture in my flat!) - I've got this table, which I absolutely love, and these chairs, which took forever to build. As I had to order a sofa weeks before I actually moved into the flat, I got my dimensions a bit wrong, and chose a sofa that is definitely too little for the space. It's left me with a bit of a gap between the sofa and my door, which was perfectly filled by my Christmas tree in December, but needs a bit of work now. I bought a massive bonsai tree (from Ikea, obvs), but it's not big enough - I have my heart now set on buying a massive fiddle leaf fig tree, but I am struggling to find one in the UK! My sofa (and it's matching footrest) are both from John Lewis (courtesy of my very kind parents!) - I went for the Portia sofa in Senna Charcoal, and it's comfy and the colour seems to be wearing well. Soba lives in the living room, in a bookcase that Joshua & I converted into a hedgehog house. 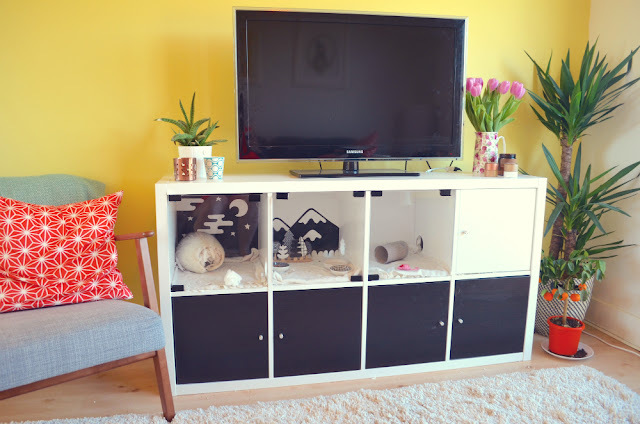 I'm still so proud of our cage DIY, I think it looks ace - and it looks even better after Josh added some vinyl landscapes to some of Soba's rooms (he lives on the top level of the unit). I've got loads of plants in this corner, more copper touches, and my favourite armchair, which is another Ikea number (but I don't think it looks too Ikea, if that makes sense!). And finally, in the very middle of the room, I have my bookcases. I've got more in my study, but this is most of my fiction collection, and I love having them all on display again after a few years living without shelves. 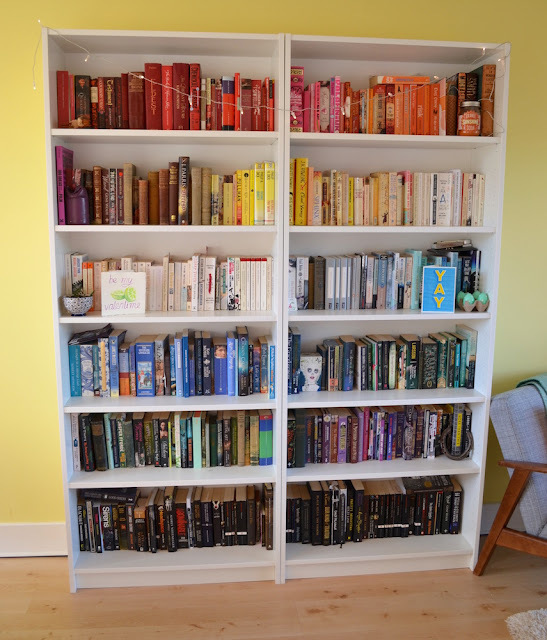 I love organising books by colour (and I can always find what I'm looking for! 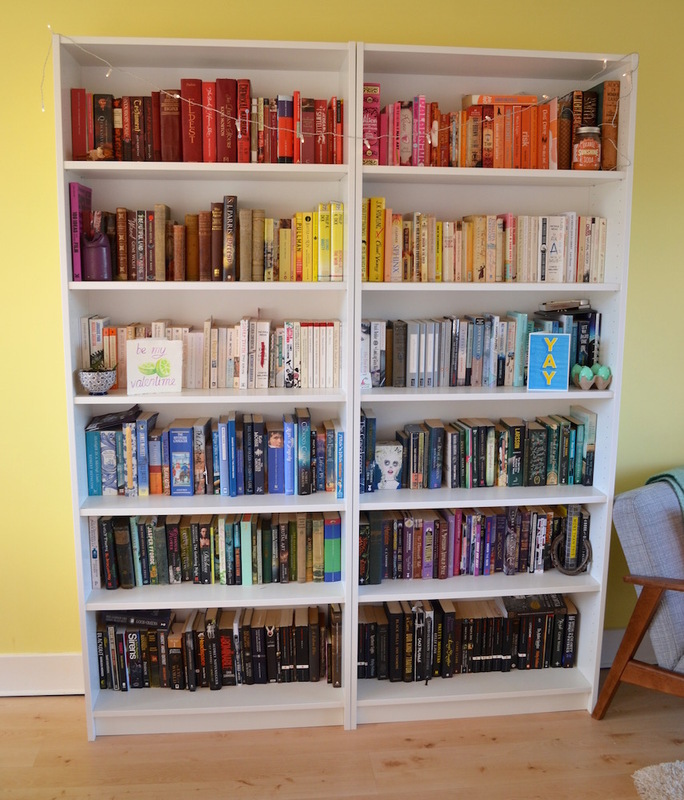 ), and it's such a nice bright way to pull the room together. I'm so pleased with how it's come together! I absolutely love this, would you like to come and style my house please? Her blogs are the most amazing one that's what I think and I always love to visit her blogs and see how creative she is with her work.